The No. 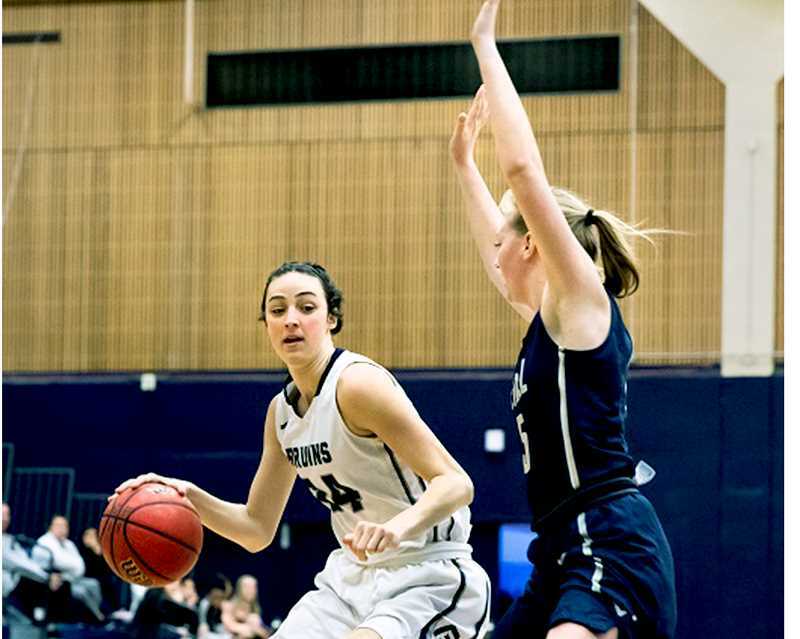 12 George Fox women's basketball is still on a roll as it enters the thick of conference play. The Bruins picked up victories over Pacific Lutheran and Pacific University on Jan. 4 and 5, setting the stage for a handful of key home games ahead. GFU beat Pacific Lutheran 67-51, overcoming a poor shooting percentage (32.8) to get the road victory. Hailey Hartney tied her career-high with 17 points to lead the Bruins. Pacific Lutheran committed 28 turnovers on the night, leading to 27 George Fox points. Both teams started slow in the first quarter as the Bruins' press held the Lutes to 11 points – just five of which were scored within the first seven minutes. As the game progressed, GFU began to extend its lead. The second quarter saw the Lutes get back within one, but from that point on the Bruins played dominant defense and executed on the offensive end, propelling themselves to a 16-point victory. Three-point shooting proved to be the factor as the Bruins shot 9-of-19 from beyond the arc. Against Pacific University, GFU won a hotly-contested game 59-54. A strong finish to the fourth quarter was enough for the Bruins to hold off the Boxers. Tavin Headings led the way with 18 points for the Bruins, including four-of-six from three-point land. A relatively even game saw an uptick from GFU in terms of its shooting percentage. It finished shooting 43 percent from the field despite losing the rebounding margin by six. The Bruins are now 4-0 in Northwest Conference play, 11-2 overall. Their next games are at home against Whitworth on Friday and Whitman on Saturday. The Whitworth game, which tips off at 6 p.m., is "Newberg Night" with free admission for residents of Newberg, Dundee, St. Paul and Sherwood. The GFU men maintained their stellar play last week, picking up their third and fourth wins in a row over Pacific Lutheran and Pacific University, respectively. The Bruins are 10-3 overall and 4-0 in the NWC and are winners of eight of their last nine games – their only loss coming at the hands of the No. 1 team in the country, Nebraska Wesleyan. The Bruins picked up a road win over Pacific Lutheran 84-74 thanks in large part to 21 points and five assists from Mason Green-Richards. A quality first half proved the difference in the game, however, as GFU entered the halftime break leading 46-34. The lead got down to five with about 10 minutes to go as the Lutes stormed back into the game, but the Bruins slammed the door shut and finished the game strong. The Lutes were within three with three minutes remaining and it took a strong performance at the free throw line for the Bruins to finish it off. The game against Pacific University was the highest-scoring performance of the season as George Fox beat the Boxers 122-93. The Bruins 69 percent from the field and dished out 34 assists as a team. GFU's leading scorer in the victory over Pacific was Ryan Lacey with 24. At the half, the Bruins led 59-38, and they never looked back despite a strong second half offensively by the Boxers. The GFU men have a different challenge than their female counterparts. The Whitworth and Whitman men are ranked No. 7 and No. 4 in the country, respectively, so this weekend's pair of games should serve as a litmus test for the Bruins' legitimacy. Those games tip off soon after the women finish.